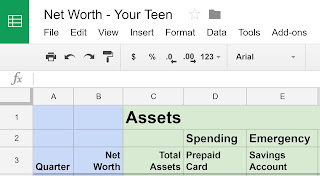 A few years back, I started putting together net worth spreadsheets for each of my teens. We share them on Google Drive and review them regularly. Net worth is a critical money concept. It’s a key measure of financial health. Net worth reveals that having a large bank balance but an even larger credit card balance is worse than having a tiny bank balance and no credit card debt. Net worth forces consideration of the full picture. Tracking net worth is a valuable habit. Monitoring net worth forces awareness. Awareness allows course corrections before finances snowball out of control. A net worth spreadsheet focuses discussion. The organized columns and concrete numbers serve as a consistent table of contents for a directed discussion with your teen. That sure beats a meandering, abstract lecture. Sure, your kids’ eyes will glaze over the first few times. But hang in there. With each iteration, interest and understanding will grow. Trust me. I’ve seen it four times now, and I’m banking on the fifth. By the time your kids head out into the real world to scratch out a living, you’ll have their rapt attention, not to mention gratitude. A net worth spreadsheet clarifies goals. I like to include aspirational columns for financial buckets that aren’t quite achievable or relevant today, but are something to shoot for tomorrow. Like a Roth IRA column for a newly minted teen to set the expectation of getting a summer job during the high school years. I also add a “goal” row at the bottom to list target values for accounts in coming time periods. Like $500 for the emergency fund by senior year. That makes goals crystal clear, in context, and relevant. Quarter. I like to add and review a new row to the spreadsheet quarterly, so I’ll record entries like “Q3 2016” here. Change the column to “Year” if you’d prefer annual. Or choose whatever frequency works best. Spending. The end of quarter balance in the account your kid uses for everyday spending — be it a checking account or a prepaid card. If your teen maintains a balance in a peer-to-peer payment service like Venmo, include a column for that too. Charitable Fund. Tracks the money accumulating in an account for regular donations. I want my kids to get in the habit of setting aside a fraction of their income for philanthropy. Emergency Fund. Money sequestered in a liquid account for emergencies. It finally dawned on me that there’s no reason to wait until your kids are grown up to teach them about emergency funds. Why not learn this critical habit early? Teens have emergencies too. That massive data plan overage charge. that first parking ticket. So I had my teens create separate emergency funds with a target of a few hundred dollars each. As they get older, the target amounts get larger. Big Savings Goal Fund(s). One or more buckets for specific medium to long term savings goals, like buying a used car, financing a Spring break trip, or furnishing a first apartment. Initially, these funds earn my outrageously generous parent-paid interest. Kids have few opportunities to earn reasonable returns, so I offer them a supremely attractive interest rate from the Bank Of Mom/Dad. Think 1970s. It’s a strong incentive to sock money away for the long haul instead of frittering it away immediately on mindless spending. As they get older, we shift these accounts from the Bank of Mom/Dad to an online bank that supports convenient sub-accounts — like Ally bank. College Fund. Money set aside in a 529 account for college. As the teens transition into high school, it’s important to start setting reasonable expectations about college affordability. If grandparents or other relatives have been kicking in 529 funds, this column serves as a good reminder for your teen to show some appreciation for their generosity. Retirement Fund. Yes, your teen should have one. As soon as each teen pulls down that first summer paycheck in high school, I create a Family 401(k) in a Roth IRA account. It’s one of the best financial moves I’ve made as a parent, and I hope you’ll do the same for your teens. I also include an empty Work 401k column in the spreadsheet as a constant reminder that I want them to sign up for one as soon as they land that first full time job. Investments. A bucket for any additional assets your kid might own in a taxable investment account. For example, I bought one of my sons fractional shares in Chipotle last year to as a speculative comparison point to his index fund holdings in his Roth IRA. The point: keep speculative bets to a minimum. Focus on low cost, diversified index funds held in tax advantaged accounts for the long term first. Hat tip Jack Bogle. Total Assets. The sum of all the preceding asset columns. Bank of Mom/Dad Loans. Yes, we make occasional big ticket item loans to our teens, like for laptops. That’s because we want them to experience the responsibility (and pain) of repaying debt before they hit the real world. That’ll reduce the chance of over-committing later when the stakes are much higher. Credit Card. Current credit card balance when they ultimately have them. Teens need to know that credit cards are loans. If you want to help your teen start building a solid credit history, I like this hybrid strategy of a credit card for some well-known fixed recurring expenses and a prepaid card loaded with a budget for discretionary expenses. Student Loans. As with the College Fund column, this is a good column to start setting realistic expectations about college affordability. Car Loan. If any. Saving up first is a better bet. Either way, focus your teen on buying used. Mortgage. Just a placeholder for the future. Maybe. Just don’t let your teens assume buying always beats renting. Total Liabilities. The sum of all the preceding liability columns. Net Worth. The bottom line: total assets minus total liabilities. 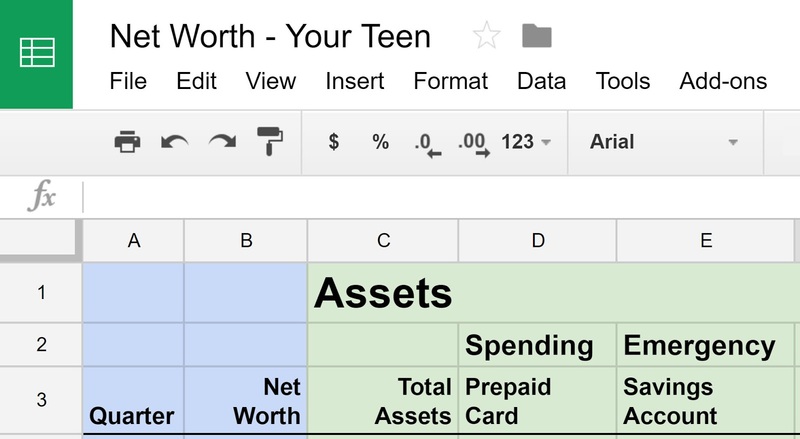 A net worth spreadsheet is one of the best techniques I’ve found to help my teens understand the big picture of personal finance. Lay out a road map to their financial independence one cell at a time. This is a fantastic idea! Practical way to teach 'adulting' before they hit the real world! Very helpful. Do you have a template we can use? I started to put one together, but I just found it to be too family specific, so I put it on the shelf for now. I'll have to give it some more thought and see if I can come up with one that's more generic.